The differences between pine tree species are evident in the disparities in size and features, as well as geographic range. Many of the native pine trees serve in landscaping functions, but several species of non-native pines have desirable qualities, endearing them to landscapers for specific situations. Know the specifics of a pine species under consideration for your landscape before planting it. Pines such as Jeffrey pine and the ponderosa pine grow so tall, only the largest open landscapes are suitable for them. These are trees capable of growing higher than 125 feet. Many other pines grow into the 50 to 90 foot range, including the eastern white pine, shortleaf pine, Bosnian pine and the red pine. Shorter pine species, suitable for planting as a buffer tree, to create evergreen borders or as part of a mass planting, include mugo pine, Virginia pine and Swiss stone pine. Upon scrutiny of pine species, you notice obvious differences in their needles. Needle size, color, texture and arrangement on the branches are the most obvious distinctions. 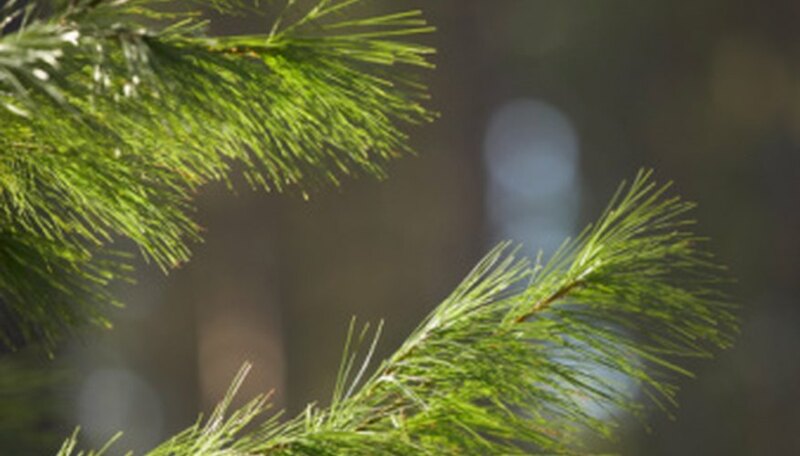 For example, the needles of the eastern white pine are up to 4 inches long, light green, supple and grow from the branches in groups of fives. The needles found on the mugo pine, however, are bright green, as lengthy as 5 inches, rigid and curved. Only two needles grow in each group, called a fascicle, from the branches. The differences in pine tree needles are a key means of identifying species. Some pine trees tolerate cold climates better than others do, which becomes an important difference when considering certain types of pines for your landscape. For instance, cold hardiness is a trait of such pines as jack pine, red pine, mugo pine and Austrian pine. These types tolerate the cold associated with U.S. Department of Agriculture plant hardiness zone 2, which sometimes approaches 50 degrees below zero F. Pines with little cold tolerance include shortleaf pine and loblolly pine, but these species withstand the heat and humidity linked with zones 8 and 9, making them useful in warmer climates. The appearance of the bark and the shape and size of the pine cones are two other features to focus upon when looking for differences in pine species – and considering them for your property. Taking the pitch pine as a case in point, you notice the bark is a light brown shade, having the appearance of possessing armor plating all over the trunk. The cones are egg-shaped, yellowish brown and up to nearly 3 inches long. Red pine has a thinner, flaky bark of colors, including reddish-orange, gray and brown. The cones on the red pine are up to 2 inches long, ovoid and a light shade of brown.